A.P.I.C.E. - Common Mediterranean strategy and local practical Actions for the mitigation of Port, Industries and Cities Emissions. Common Mediterranean strategy and local practical Actions for the mitigation of Port, Industries and Cities Emissions. On 28th February 2013, after three years of work, APICE was completed. Barcelona, Marseille, Genoa, Venice and Thessaloniki have developed a knowledge-based approach for air pollution mitigation and sustainable development of port activities, managed by spatial planning policies at local level, which includes the territory around the harbours. 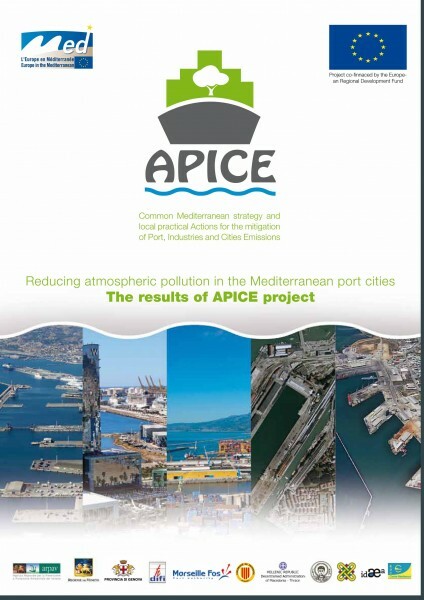 The main results of the project are available in the final publication: " Reducing atmospheric pollution in the Mediterranean Port Cities - The results of APICE project"
APICE has produced the Common Transnational Strategy (CTS), which is meant to support policy makers and local communities to develop their own strategies to mitigate air pollution in coastal areas. CTS aims at constituting a road map to develop a common Mediterranean path to curb emissions that is further articulated in local adaptation plans, according to a principle of environmental, economic and social sustainability. The Local Adaptation Plans (LAPs) have been drafted in each project area and they represent the roadmap at the same time to elaborate and to scale down the CTS at local level, according to the approach developed within APICE project. Reports containing the 5 LAPs are available . APICE roadmap, which lead to CTS and LAPs, is available here.